Over the past year, Under Armour (NYSE:UA,UAA) has outperformed Adidas (OTCMKTS:ADDYY), at least in the equity market. Though both stocks trail industry leader Nike (NYSE:NKE), Under Armour stock has gained 11.3% over the past 12 months; Adidas stock has risen just 2.3%. Of course, part of the reason for Under Armour’s outperformance of late is that it compares to a much lower base. Under Armour stock hit a four-year low late last year, though it’s bounced about 80%. Over the past three years, it’s Adidas stock that’s been the star, having tripled over that period. And looking forward, Adidas stock still looks the best play in the space. I’m still a bit skeptical toward NKE’s valuation after its big run. And I’ve been bearish on Under Armour stock going back toward last year (though Under Armour is a much smarter play than the more expensive Class C UAA shares). Adidas stock isn’t exactly cheap at 25x 2018 EPS estimates, but it’s cheaper than Under Armour. Moreover, at the moment looks like the better company as well. The biggest selling point for Under Armour stock is that it has the most upside. It’s the smallest of the three and, in the near term at least, it has the most room for improvement. Operating margins are extremely narrow adjusted margins are guided to roughly 3% this year. Assume 100 or 200 basis points in gross margin expansion, and that revenue grows fast enough to start leveraging operating expenses, and those margins can expand quickly and Under Armour earnings can soar. The problem is I simply don’t think those assumptions are feasible. 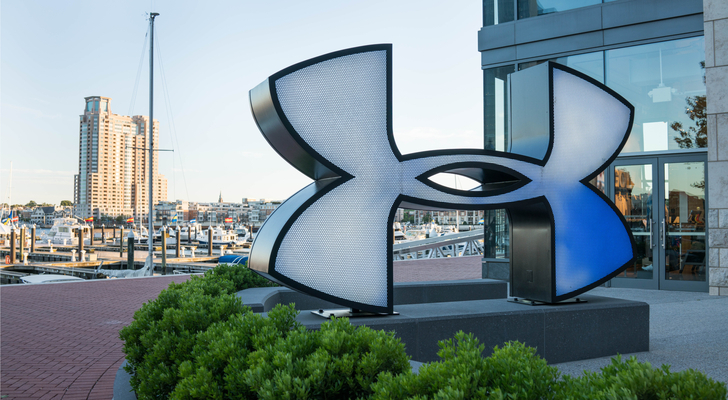 In footwear, Under Armour remains a distant third to its larger rivals. International expansion offers a potential driver . In fact, overseas sales are guided to rise more than 25% this year. And I’m not sure gross margin can expand all that much; if anything, Under Armour is going to have give back pricing if demand doesn’t strengthen. Meanwhile, Under Armour stock is trading at over 100x 2018 EPS guidance and something like 60x EBIT guidance. Again, margin expansion can bring those multiples down quickly. But it will take years and Under Armour stock already is pricing in quite a bit of improvement that I’m not convinced is coming. The case for Adidas stock is much simpler. The company is performing exceedingly well and investors in Adidas stock are paying up for quality. Q2 revenue rose 10% in constant currency, with 26% growth in e-commerce. Margins are expanding across the board, with gross and operating margins rising nicely in the quarter (and the first half). Full-year guidance suggests more strength, with revenue expected to rise 10% for the year as well. Gross margins should expand 30 bps, SG&A should be leveraged 20 to 40 bps, and EPS is expected to rise to about 8 euros, up 12-16% year-over-year. A 25x multiple for that kind of growth seems more than reasonable; in fact, Adidas stock is valued roughly in line with Nike while the company is growing faster. And from here, Adidas looks to be in a sweet spot as a stock and a company. The valuation is pricing in growth but hardly a massive improvement or any structural changes. As for the company, Adidas has enough market share to keep growth intact – but is small enough that more share gains can drive growth for years to come. From here, Adidas stock simply looks like the easier, and smarter play. Under Armour stock is higher-reward but higher risk as well, and YTD performance seems to have been outpaced by the gains in the stock. And were I to take a higher-risk bet on footwear in particular, I’d rather look at Foot Locker (NYSE:FL) or even Skechers (NYSE:SKX) after its big dip. Article printed from InvestorPlace Media, https://investorplace.com/2018/08/under-armour-sneaker-bet/.